THEY JUST CAPTURED IRAQ’S MOST WANTED TERRORIST. On a daring nighttime raid in September 2009, a team of Navy SEALs grabbed the notorious terrorist Ahmad Hashim Abd al-Isawi, the villainous “Butcher of Fallujah,” mastermind behind the 2004 murder and mutilation of four American contractors. Within hours of his capture, al-Isawi, with his lip bleeding, claimed he had been beaten in his holding cell. Three Navy SEALs—members of the same team that had just captured the notorious terrorist—were charged with prisoner abuse, dereliction of duty, and lying. On the word of a terrorist! The three Navy SEALs were placed under house arrest and forbidden contact with their comrades. 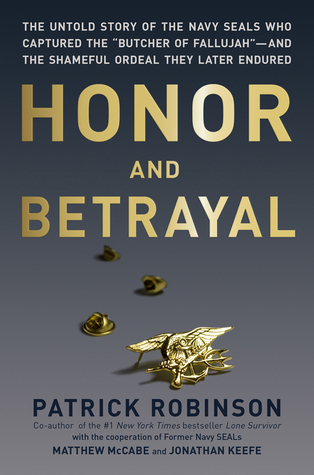 Despite enormous pressure from their commanders to sign confessions to “lesser charges,” the three resolute and fearless SEALs each demanded a court-martial. They were determined to prove their innocence. When Fox News broke the story about the accusations, Americans were outraged. Over 300,000 people signed petitions demanding the SEALs be exonerated. Their SEAL teammates were furious; but nothing could stop the cold determination of the military’s top brass to hang these guys out to dry—not even U.S. congressmen who petitioned the Pentagon to drop the charges. I came across this book in the library and it caught my attention. The basic story is that three Navy Seals are brought up on charges of abuse to a prisoner and they do not accept the Army version of what happen because nothing happened. The prisoner made accusations against them knowing that the charges would have to be looked into. The man they captured the “Butcher of Fallujah”, knew what was going to happen to him in the end so he had to come up with any way possible to delay his outcome, or fate. The three Navy Seals are like anyone who has done nothing wrong and will not admit to even something that the Army considers a lesser charge because in the Navy it is still a serious offense. Then it becomes a General by the name of Cleveland, who does not want to dismiss the charges even when he is being requested by members of Congress, and the American people. He digs in deeper for a fight that ends up costing tax payers over 2 million dollars, not counting the lost training for two Seals when they leave the service even though they all were found not guilty of any charges. After the court Marshall Hearings they were allowed to go back to the teams which they did but two of them did not re-enlist. But this goes along the lines of police officers and other law enforcement personal, being accused and the higher ups taking the word of a criminal over everyone else. Plus you have the young man who was guarding him only 19 and he left his post twice, and he should have had more help as well. A good book but sad that these men were treated this way. I gave it 4 stars.